A dog's time on earth is all too brief in comparison to the lasting legacy they leave on our lives - but few have left such an indelible mark on history as Bretagne, who passed away this week at the age of 16. Bretagne was just a year old when, in the days after the September 11 attacks on the World Trade Center, she was deployed to Ground Zero with members of the Cy-Fair Volunteer Fire Department's K9 Search & Rescue Team, from Texas. Serving alongside her owner and handler, Denise Corliss, Bretagne spent weeks scouring the wreckage for survivors and the remains of those who had perished, while at the same time, offering emotional relief to her fellow rescuers. Hundreds of dogs assisted in the efforts, though in time Bretagne would be the last among them. Bretagne's brave work at Ground Zero wouldn't be the last time she stepped up during a time of national crisis. Later, she served in similarly heroic rescue efforts in the wake of Hurricane Katrina and Hurricane Rita. Bretagne officially retired from active duty in 2010, but she continued to serve her community in other ways. Since then, until just a few weeks before her death, she was a regular visitor to local elementary schools, offering anxious students a patient audience to help them practice reading. 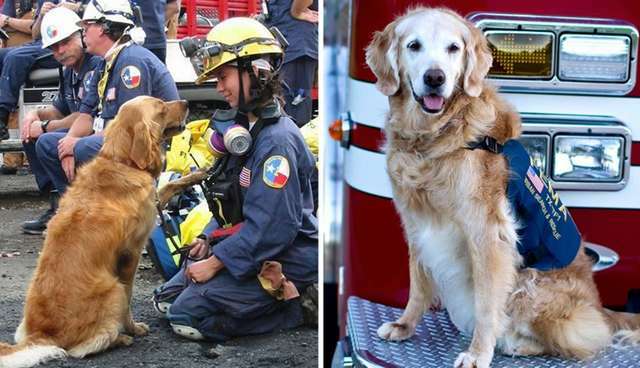 Last year, Bretagne was recognized as the last surviving canine responder in the aftermath of 9/11. On the 14th anniversary of that sad day, her face then clearly touched by time, Bretagne returned to the site of Ground Zero to pay tribute to those who were lost. As Bretagne's health began to deteriorate in recent weeks, Corliss made the heartrending decision to end her suffering. On Monday, dozens of service members gathered to pay one last farewell to her on her final walk - saluting the brave dog as both a colleague and a friend. Like all dogs who serve, Bretagne's years of tireless work and all the lives she's touched can never be fully measured - but the legacy she's left behind will live on forever in those who knew her best. "Some may say that the most a dog could be is a pet, however, to the over 400 members of the Cy-Fair Volunteer Fire Department, Bretagne was a civil servant, a hero and is family," the department wrote in a statement. "We will remember her fondly, and continue serving the community with her as inspiration."